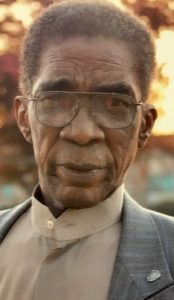 Nathan McFadden, 79, of East Orange, NJ, formerly of Lancaster, passed away at his home on January 23, 2019. Born in Dillon, SC, he was the son of the late Hardy McFadden and Mary Sue (Evans) McFadden. An iron worker by trade, when Nathan was not working, he enjoyed watching sports, rooting for New York teams, and fishing. He would travel to Delaware and upstate New York to fish and would take any opportunity he had to go down south to visit family. Family was extremely important to him. He was close with his many siblings and missed them greatly when they passed before him. Playful and fun-loving, Nathan was the life of the party and loved to have a good time. He will be remembered for his generous spirit and big heart. He is survived by his daughter, Denise Jenkins and her husband Luke, grandson, Marcus Wilson, and his four great-granddaughters; Tiana, Mariah, Winter, and Jalina. He is also survived by sisters-in-law; Dora McFadden, wife of the late Earnest McFadden Sr., and Elouise McFadden, wife of the late Roosevelt McFadden Sr., and a host of nieces, nephews, cousins, and their families. He is preceded in death by his parents, Hardy and MarySue McFadden, siblings; Earnest Sr., Roosevelt Sr., John Sr., Luke, Charles, Maude, Hattie, and Mary McFadden, a granddaughter Brianna Jenkins, great-grandson Marcus Wilson Jr., and his longtime companion of over 25 years Bertha Sims. Services will be held Saturday, February 2, 2019 at 11:00am at Bright Side Baptist Church located at 515 Hershey Ave, Lancaster, PA 17603. Guests will be received starting at 10:00am. Interment will follow at Mellinger Mennonite Cemetery. sending Deepest Sympathy. To The Jenkins And McFadden Family. From The Morant Family. We were saddened to see of the passing of your father and wanted you to know you and your entire family will be in our thoughts and prayers at this time of grief in your lives. May your father rest in peace with all the angels and saints in Heaven, especially your angel Brianna. Uncle Nathan will be deeply miss by me, he was my partner will would get it on, like husband&wife I knew how to deal with him, I love him and I will miss him a lot. I did get a chance to talk to him Thanksgiving Day and said to me he was alright. Your niece Ree.